Dr David Bates (Director of Politics and International Relations) was at the House of Lords on 15 October to celebrate the publication of Marxism, Religion and Ideology: Themes from David McLellan. Dr Bates edited the book with Dr Iain MacKenzie and Professor Sean Sayers from the University of Kent. Contributors include Lord Bhikhu Parekh, and the former Archbishop of Canterbury, Lord Rowan Williams. The book also contains an essay in which Professor McLellan responds to the contributions in the book. 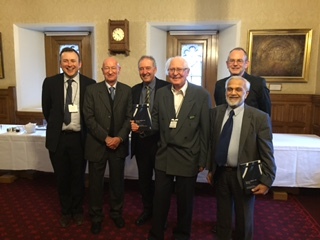 From left to right: Dr David Bates, Professor Larry Wilde, Dr Alistair McLeish, Professor David McLellan, Dr Iain MacKenzie, Lord Bhikhu Parekh. 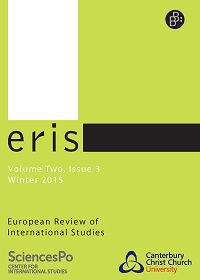 ERIS – Latest Issue Out Now!